In the first century ad the Roman author Pliny the Elder wrote in his Natural History (34.69–70) that the famous fourth century bc Athenian sculptor Praxiteles had created a bronze sculpture depicting a youthful Apollo about to stab a lizard with an arrow. He used the epithet sauroktonos (lizard-slayer) to refer to Praxiteles’s masterpiece. Several Roman marble copies of the work have survived, attesting to its popularity well into the Imperial period. Acquired by wealthy Romans to decorate their homes and country villas, these copies show a young figure of Apollo leaning on a thick, leafless tree trunk, up the surface of which climbs a lizard. Thus, the sculptural type has been known since Roman times as Apollo Sauroktonos. Roman coins and engraved gems also illustrated the sculptural type, but instead of a stout tree trunk, several pictured Apollo with a slender sapling. The Roman poet Martial used the adjective sauroktonos in what was possibly a reference to a reduced-scale copy of the original, perhaps cast of a special bronze alloy. 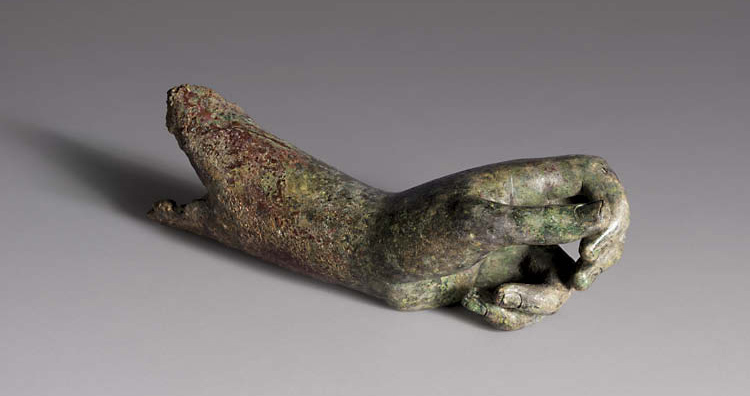 In 2004 the Cleveland Museum of Art acquired the only known bronze version of the sculptural type. It had been recovered from an estate in eastern Germany after German reunification. At that time the legal heir, an elderly gentleman, successfully claimed the estate and subsequently found the sculpture in a pile of debris. He remembered having seen it several times as a young man when the property belonged to his great-uncle before the outbreak of the Second World War. Because he believed it to be an 18th- or 19th-century work inspired by an ancient prototype, he thought it not worth reconstructing and sold it. Shortly afterward it was identified as ancient and conserved. 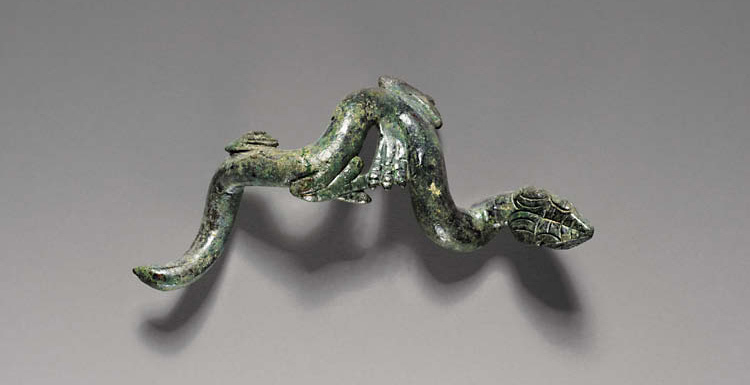 I saw it in 2003 in the Geneva gallery of Phoenix Ancient Art, and the museum acquired it the following year. 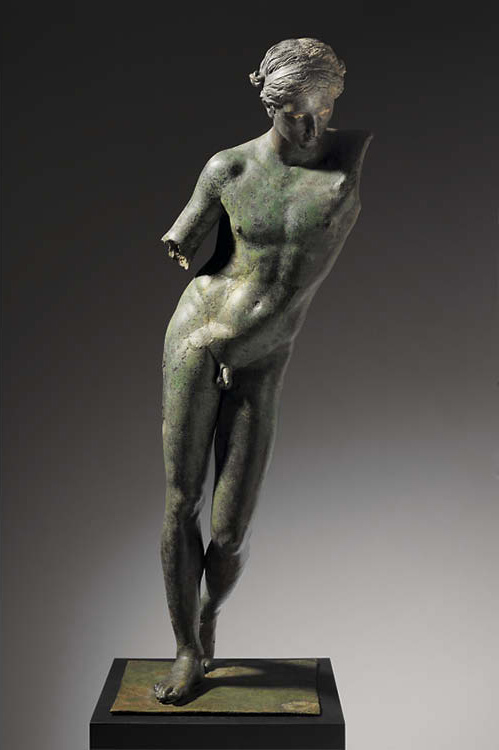 Showing signs of severe damage perhaps sustained during fierce fighting between Hitler’s Nazis and the Red Army in eastern Germany, Praxiteles’s masterwork was subsequently stranded between the destructive mayhem of WWII and the paranoia of the Cold War. The art market rescued it. All of its technical features are consistent with a date in the Late Classical period and Praxiteles’s lifetime. It is clearly the product of a first-rate workshop as evidenced by the extremely high quality of the modeling and finishing and the close attention to fine detail evident throughout the figure. Consequently, the museum has dated the work to about 350 bc and believes it might well be the very sculpture described by Pliny. The Roman marble copies, carved hundreds of years later as collectors’ items and decorative embellishments, no longer retained the religious function and meaning of the original. The Cleveland Apollo permits us to reconstruct the original context and meaning of Praxiteles’s intention and vision. The Cleveland Apollo is missing the right arm from above the elbow, the tree, and a large section of the left arm and shoulder. The current base is not ancient. Fortunately, the left hand and much of the forearm survive, along with a small reptilian creature. This creature is the key to the work’s meaning. Its strange anatomy—that of a coiled snake with legs of differing sizes attached asymmetrically—proves that it is not a lizard from the natural world, but a reduced-scale Python from the world of myth. Such asymmetrical and composite features are a violation of nature and identify this legged serpent as an agent of disorder. Apollo is its polar opposite. He is the god of light, music, reason, and order, the headmaster of the Muses. Praxiteles’s original creation represents Apollo’s victory over the Python, a triumph of order (kosmos) over disorder (chaos). The sculpture must have been made for the sanctuary of Pythian Apollo at Delphi. There, Apollo presided in his temple over his revered oracle at what the Greeks called the Omphalos, the navel (center) of the world. Before governing over the sanctuary, Apollo had to vanquish the Python, son of Mother Earth. 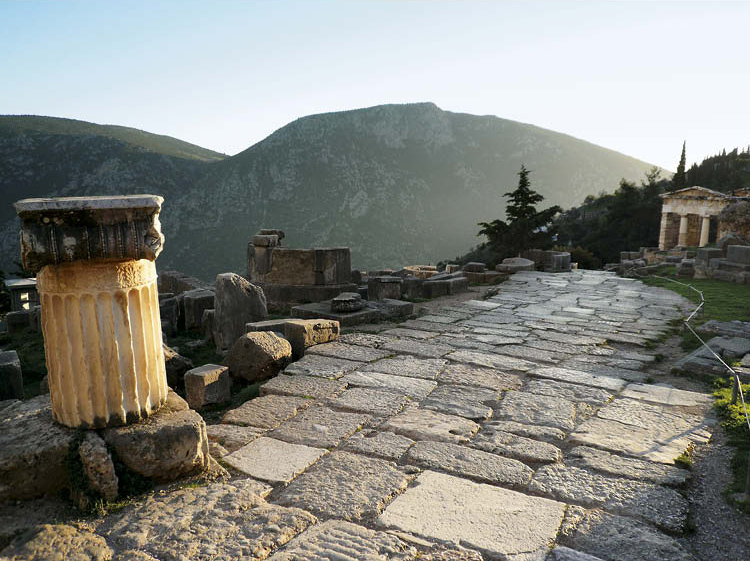 This foundation myth was ritually renewed during the Septerion festival at a circular area (the Halos) on the Sacred Way at the Delphi sanctuary, where Apollo’s triumph was reenacted by a boy impersonating the god. In all likelihood the emperor Nero transferred the sculpture to Rome where Pliny subsequently saw and described it, using what was a nickname or misnomer. Over time the Roman marble copies no longer accurately reproduced Praxiteles’s Python, but instead incorporated heavy tree trunks and large lizards to better accord with the work’s popular title. Until the museum’s acquisition of the bronze original there was no reason to doubt that Praxiteles’s great work was a Sauroktonos. The Cleveland Apollo demonstrates that Praxiteles’s famous Apollo can be called Python-Slayer.